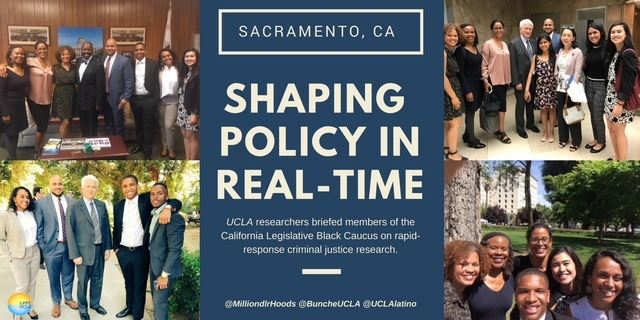 Last week, Dr. Kelly Lytle Hernandez, professor of History and African American Studies and the interim director of the Ralph J. Bunche Center for African American Studies at UCLA, along with Associate Professor Chandra Ford, Chancellor Gene Block, and UCLA students, journeyed to Sacramento to meet with members of the California Legislative Black Caucus. There they discussed Million Dollar Hoods and the policy interventions and solutions that can be implemented to improve Los Angeles and advance justice reinvestment campaigns. Connecting research to actionable policy is a major objective of Million Dollar Hoods and Professor Lytle Hernandez’s work.